The groundbreaking for the Astra Zarina Belvedere will take place in Civita di Bagnoregio on April 8th at 12:30 PM. The memorial was designed by Steven Holl in homage to his former professor. The small belvedere space located on the northern side of Civita di Bagnoregio will be dedicated to the work and life of Professor Astra Zarina, an architect, professor and long time resident of Civita. The new space will consist of new gates, new benches, planters and a central bronze and stone sculpture/fountain commemorating the primary “spheres” of Astra’s work, life and influence. 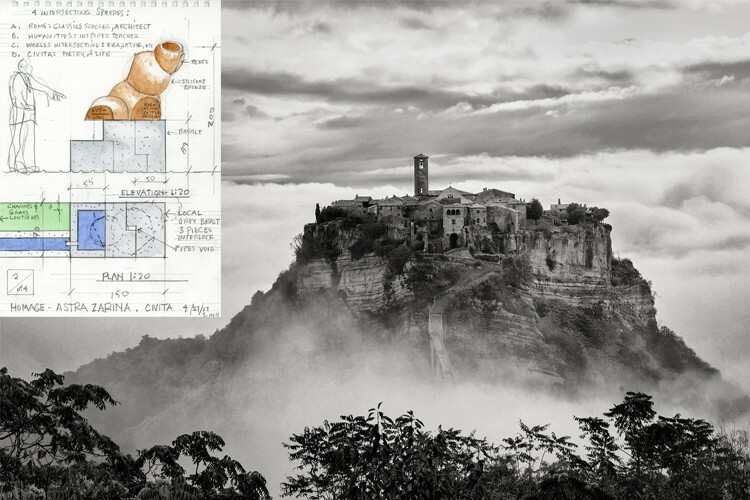 Shown above is a site map of the Civita di Bagnoregio and a watercolor of the sculpture.